The Blindness of Daredevil: An Advantage or Disability? Superheroes are an intriguing concept. These individuals, having been blessed with a certain power, or skill set, devote their lives to using their advantages for good. However, what would happen if, instead of having additional abilities that transcend the limits of human capability, they actually lack some? This is the premise for the story of Daredevil, a blind man who has developed heightened auditory and tactile senses. In the new Marvel Television series, airing this year, we see this blind superhero using his superior senses to fight crime. Is it possible for an individual to completely replace a lacking sense with their remaining senses? The answer lies in discerning whether or not it is possible to achieve the heightened sense that Daredevil has, and use them in the way that he does. He would need to be aware of both his surroundings and his current situation in enough detail to react just as fast as someone with vision could. Interestingly, there has been a lot of research into the abilities of those who are affected by blindness, giving potential answers to this question. It is common knowledge that most people who are blind have a highly attuned sense of hearing. The reason for this is due to the neural re-mapping of the brain. When individuals suffer from blindness the part of the human brain devoted to visual interpretation becomes redundant. Fascinatingly, this space does not go to waste, but is rather synoptically remapped to the auditory and tactile parts of the brain. The increase in neural pathways allows the brain to develop highly sensitive senses for both hearing and touch. To be most effective, the re-mapping needs to take place during childhood. This is a fortunate coincidence for Daredevil, having lost his sight at the age of nine. Therefore, it is actually expected that Daredevil would have superior hearing and touch. Okay, so he has super hearing, but how would he use it? Studies involving the auditory perception of blind individuals show that they have an adept ability to locate the direction of noises. So in Daredevil’s case, he could determine the his foes’ positions. His ultra-sensitive hearing could also pick up the cocking of a gun before it fired, giving him the opportunity to jump out of the way. However, this wouldn’t be enough in a fist fight. Although he could tell from which direction his foes were coming from, he would have difficulty knowing how far away they were. would generate sounds either through his mouth or other means and measure the delay in the echoes created from the sound bouncing off nearby objects. Through this delay he could obtain information on the objects surrounding him, including the size and shape. This is a common technique bats utilise to help them to fly in pitch darkness. Furthermore, this technique could also determine the speed of certain objects moving towards or away from him, due to the change in pitch of the return echoes, caused by the Doppler Effect. Although this may sound far fetched, this technique of echolocation is actually frequently used by both blind people and people who can see. Studies have shown that the time difference in echoes can be measured unconsciously in humans. 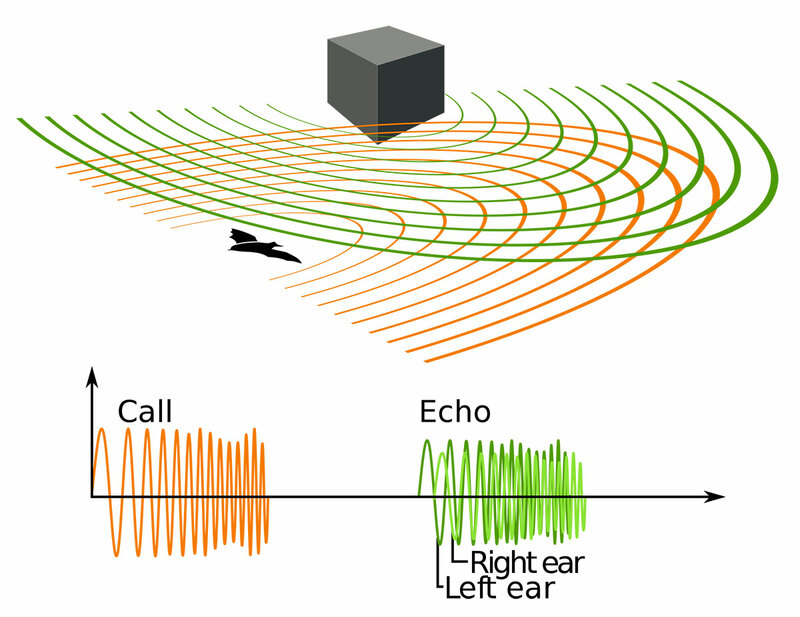 People who are placed in a room with an echolocation device can detect objects in that room. It has also been noted that blind people sometimes make clicking noises with their mouths, and since their hearing is much more sensitive, they can hear the return echoes of the clicks. Thus if utilised effectively, Daredevil could possibly paint a constantly changing mental map of his current situation, when he’s out crime fighting. However, in order to use echolocation effectively, Daredevil would need to be able to differentiate and quickly switch focus from different sources of sound. We actually see Daredevil doing this when he is on top of a building scanning for people who are in trouble. It is also a trait of blind individuals, who are incredibly adept at isolating different sounds from multiple sources at once. Such a technique would be useful in combat as well; Daredevil would be able to discriminate between sound sources incredibly quickly, to determine the most important at the current moment. We see this in some of the slow motion fights, when he notices a knife switching hands and is able to react in time to avoid it. Alright, let’s say that Daredevil has mastered all these techniques; would that make him able to naturally fight better than a person who has the ability to see? It is unlikely that this is the case, and we see that when he fights. He still gets hit, and his fighting style relies heavily on staying close to his opponents, which enables him to rely on both his heightened auditory and tactile senses. It is very likely that someone other than Daredevil, given his enhanced abilities, would not be able to achieve the feats that he does. It is not just the fact that he is blind that allows Daredevil to be the superhero that he is. His upbringing has also complemented his rise. His dad encouraged him to work hard, leading to Daredevil believing himself to be unhindered by his blindness. This is why he is a lawyer, and why he taught himself to move and fight the way he does. He has grown up learning it is possible to overcome any obstacle that arises in his life, giving him the motivation to become Daredevil. Therefore, since there is documented evidence of heightened sense in blind people, we should expect Daredevil to have these abilities. However, the question of whether he could achieve the feats he does relies on the scale to which an individual’s senses could be heightened. This is where the radioactive chemicals help. That being said, Daredevil would not have become the man he is if he hadn’t worked for it. In reality we have people like Stevie Wonder and Ray Charles, who did not let their disability prevent them from succeeding. Hence, it doesn’t take too hard a stretch of the imagination to believe that a man like Daredevil could possibly exist.